MetaStock XENITH is the complete real time data and news software used by the professional trader. Get MetaStock XENITH for 1 month FREE! With real-time data & news software, fundamentals, economic reporting, analytics, and much more, MetaStock XENITH is quite simply the most powerful platform available to the private trader. It is more comprehensive, more intuitive and more collaborative than anything you've ever worked with... and it's never been available to the private trader until now. 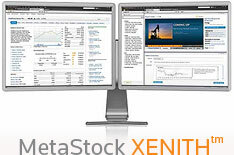 Access to MetaStock XENITH is included with your MetaStock Pro 13 subscription, and may also be purchased as a separate subscription. Add the optional MetaStock Pro software package, and take your technical analysis to a whole new level with the time-tested PowerTools: The Explorer, The Expert Advisor, and the System Tester. These are just some of the features of MetaStock XENITH there are so many more, see for yourself.